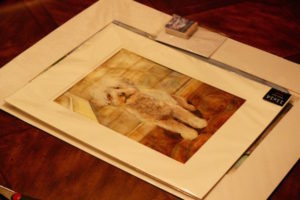 When you start your own art business, you quickly learn that when you sell a painting, you have to figure out how you’re going to get the artwork to your client. Packaging is really important for two reasons: 1) you want to make a great first impression and 2) you want to protect the artwork when it’s being transported. 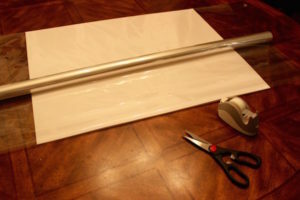 Most pre-cut mats come in a clear protective sleeve, which can be reused to protect your painting. 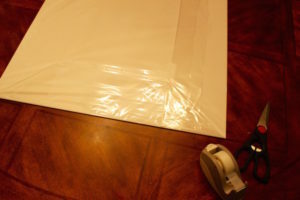 However, if you have to cut your own mat, you’ll want to wrap the painting in a clear protective film. This film can be purchased from most art stores. I always cut out a piece of foam board to add stability and hide the taped painting on the back of the mat board. It creates a nice sandwich effect, placing your painting between the mat board and foam board. 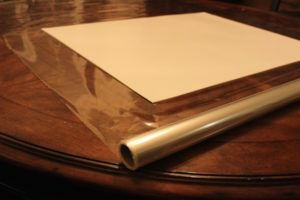 Always put the painting face down on the clear protective film so you can tape the edges to the back. I like to show appreciation to others who support the arts (and me!) My thank you cards and business cards are professionally printed with examples of my artwork and logo. Great looking cards show your level of professionalism and can help showcase your brand. You can include extra business cards so the client can share them with their friends. 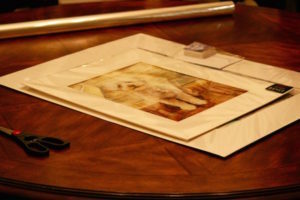 Once your artwork is matted and protected, it’s time to ship it. I typically send artwork in a box filled with shipping peanuts, bubble wrap or air filled shipping bags.